Kobe's ever increasing list of inks were for a while only available from Japan. These were more easily available than some other Japanese exclusive inks because they shipped internationally from Nagasawa's - the store that sells Kobe inks - Global Rakuten store. More recently they began being sold by some US stores such as Vanness and Pen Chalet and this year they came to Australia which I'm, personally, pretty happy about. Kobe #07 "Kaikyo Blue" is named after the water under the Akashi Kaikyō Bridge, a suspension bridge, and the longest in the world, in Kobe, Japan. 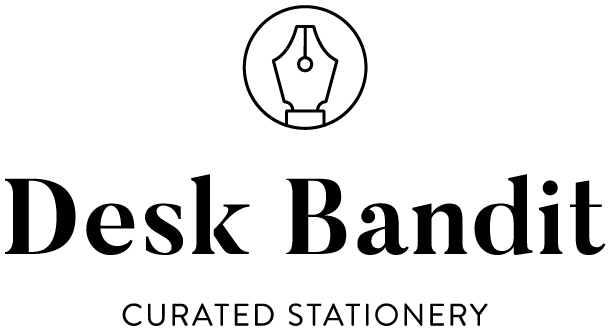 A new store called Desk Bandit has opened in my city (that does international and national deliveries with free-shipping thresholds and a 15% discount code if you subscribe to their Newsletter) and I emailed them asking whether I could write something small about them. After ordering a few Kobe inks, some Colorverse inks, and an Opus 88 Koloro from themthey added an extra bottle of Kobe Kaikyo Blue to my order. This isn't a sponsored review in a traditional way, but it is in another sense in that I think the people behind the store are doing a great job getting new and interesting stock and at good prices plus these are local to my so I have my own selfish interest in their success! I'll talk a little about them later in the review but there will be no affiliate links and I'd like stress that I was the one who reached out to them.